I have a confession to make: I am not very good at sharing. I’m pretty abysmal at it, in fact. Thinking it’s the right thing to do, I try my best time and time again, but almost always end up wishing I hadn’t. My things are mine, I like things done a certain way (my way) and I cannot abide not being the boss in any given situation. Oddly enough, despite all this there are still some people who put up with me and are happy to have me as a friend. The lovely Davinia is one of them. Davinia and I first became friends online back in the days when you needed an invite to join DeadJournal. Somehow, despite living on an island which “covers just over 300 km² in land area, making it one of the world’s smallest and most densely populated countries” (thanks, Wiki), we still managed to go some time without meeting each other in person. The first time I saw Davinia she had bleached blonde hair and, I’m sure she won’t mind me saying, a very small boyfriend whose head was too big for his body. We have been firm friends since the first rather bewildered look we shared on day one at University, more years ago than I care to admit. She has since upgraded to red hair and a much more suitably sized boyfriend. 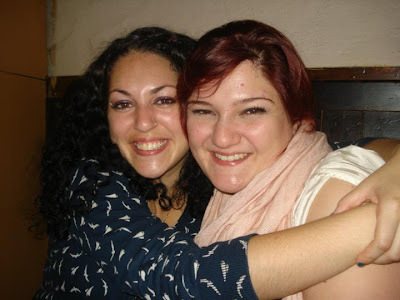 Davinia has been there offering me a shoulder to cry on, an ear to bend or just another double vodka throughout the whole shebang: cheating boyfriends, crazy flatmates, family problems, Greek and Latin-induced tears… you name it. Keeping in touch was never really an issue when I left the rock and moved to Dublin back in May last year and we remained close. A week ago we once again became closer when Davinia jumped ship and moved to Dublin too. Not only do we live in the same area once again but now we also share a house. P.S. You owe me a game of Scrabble. It's not idiotic at all – you're used to having your own space, and you have your own “way of doing things”, so obviously it's going to taking some adjusting, getting used to someone else's way and finding a good compromise! Case in point – my landlady comes to visit once in a blue moon, and when she does, she re-arranges my kitchen to the way SHE likes it. It drives me absolutely bonkers. PS: Jealous you get to share Dublin with your best friend. So many good experiences await! It's completely normal to feel the way you are, and I'm sure Davinia understands 🙂 I suppose it's a similar situation to moving in with a partner, and in both cases it takes time for both people to adjust. Yeah I'm adjusting now 🙂 I'm just one of those people who gets very set in her ways so it's hard to change things up sometimes!